Tough t Times: Sat Pal, managing director of Globe Metal Industries at the Indian Handicrafts and Gifts Fair in Greater Noida. His company is one of India’s biggest exporters of Christmas decorations. 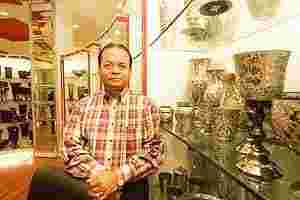 New Delhi: Handicraft exporter Globe Metal Industries’ managing director Sat Pal wants to spoil customers for choice when they visit his 3,000 sq. ft stall at the Indian Handicrafts and Gifts Fair that starts in Greater Noida on Wednesday. Pal is hoping that the variety on offer at the stall, lined with crystal-studded Christmas trees and glass-blown coloured bells, will convince foreign buyers to open their wallets and dispel some of the gloom cast by a slowing economy and choppy financial markets. “We are not expecting too many customers," Pal said, as he stuffed every inch of shelfspace with products which include hurricane lamps, candelabra and steel-finish snowflakes. “But we can at least give them more varieties to choose from." For Pal, whose company is one of India’s biggest exporters of Christmas decorations, and other handicraft makers, the three-day event at the sprawling glass-and-steel India Expo Centre in this New Delhi suburb is badly timed. A global economic slowdown, punitive inflation and turmoil in financial markets stemming from the spreading US credit crisis has dampened consumer spending, resulting in fewer orders for handicraft exporters. Terrorist attacks across Indian cities in recent months is also keeping some buyers away, said Rakesh Kumar, chairman of the Export Promotion Council for Handicrafts, organizer of the event. “Some of the buyers have cancelled their visits, but it’s not a panic situation," he said. “We will be able to see sustained growth with the weakening rupee which will give exporters an edge and by launching extra promotional drive in newer markets, such as Latin America." But the 1,300-odd participants—makers of handicrafts ranging from decorative beads and home furnishings to furniture—aren’t so optimistic. Pal, whose firm exported handicrafts valued at about Rs40-50 crore last year, has seen his orders halve this year as international clients want to first clear old inventory. His exports to the US are down 70%, he says, and he managed to ship only one-tenth of what he exported to Norway last year. Orders from Canada to Greece, which usually start trickling in by June for the year ahead, have, too, been slow, he said. Two out of the three furnaces at Pal’s factory in Moradabad, a handicraft manufacturing hub in north India 160km from here, are idle, forcing him to cut contract labour from 650 to 150. “The handicraft business is the first to be affected because you have to build a house and buy clothes first before thinking about spending on it," Pal said. “Our business is way down and our costs are going up because we have to travel to search for new markets, “ said Pal, who will be on his way to a Hong Kong Fair on the weekend. Slow business, he said, “will have a major impact on employment." India’s handicraft industry employs nearly six million people. Lower export orders are forcing some companies to cut back on labour costs. Last year, the industry was hit by a weak dollar, and although the US currency has bounced back sharply against the rupee in recent months, it hasn’t translated into higher shipments, exporters say. In April-December 2007, the last period for which figures were available, exports of handicrafts fell 11.58% to Rs10,458.04 crore. “People are worried everywhere. The UK market is bad and Denmark is yet not so bad," said S. Dahl Jensen, a buyer who deals in both the countries. Exhibitors here are bracing for worse to come. “We have not seen the full impact yet, it is still coming. Who is wounded if Uncle Sam has empty pockets? It will be the Asian nations who depend on orders from these developed countries," said Amit Malhotra, partner in Gurgaon-based Asian Handicrafts, a decorative gifts maker that exports to the US. A slowdown in orders is causing Masterstroke Interiors Pvt. Ltd, which makes picture frames and tabletop accessories for the American and European markets, to trim costs, cut labour and produce leaner designs. “The slowdown has been there for a year, just that nobody was talking about it. Nobody wants to keep inventories any more. They want cash, which is a cherished commodity these days," said Ajay Mittal, Masterstroke’s managing director. The company’s line of animal-bone picture frames, known as Distress, was popular in the US, but last year much of his business shifted to Europe. Yet, there are some who maintain that with the right marketing strategy and innovative products, one can escape the brunt of the crisis. Jodhpur-based Bonafide Exports makes furniture out of recycled wood retrieved from ship-breaking yards. Most of its products are sold in Europe and the US. The company, said managing partner Birendra Bengani, has not experienced a slowdown yet and seen 20% export growth over last year. A bigger issue for him in these tough times, Bengani said, is to keep out competition and avoid mass-scale copying of his designs by prying visitors. A large message that reads “photography is strictly prohibited" hangs outside his stall and much of the glass wall around it is covered by white sheets to fend off prying visitors. Inside, Nancy Knight, a buyer from California-based Smith & Hawken Ltd, a furniture retail brand that caters to upscale American clientele, is happily clicking photographs. “Even if it has been a bad year for business, smart retailers have to find new things and keep customers interested," Knight said.